World Chess Championship 2014: Will Sochi be more exciting than Chennai? Hello chess blog friends, Come November 7 (Sochi World Chess Championship) and World Chess Champion Magnus Carlsen will not be meeting the same Viswanathan Anand he met a year back in Chennai for the summit clash. Former World Chess Champion Viswanathan Anand is a brand new version of himself. That was evident when he won the Khanty Mansiysk Candidates to set up a return title match with Magnus Carlsen. Just a few weeks back, Anand convincingly won the Bilbao Grand Slam Chess Masters event. Seeded second, Anand had to draw with Ruslan Ponomoriov in the fifth round to take the title. Anand won the title with a round to spare! 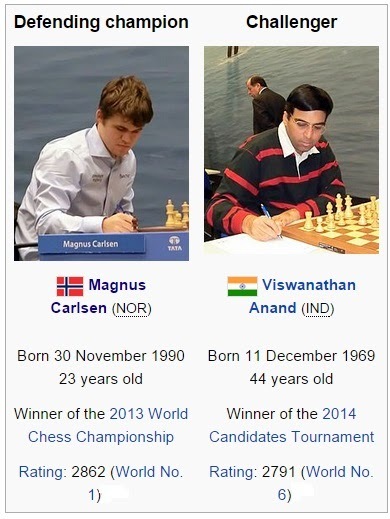 That was the last chess event before the Indian takes on Magnus Carlsen who is half his age. But, at 44, Anand couldn't be looking better - fitness-wise and chess-wise. In Bilbao chess, Anand finished ahead of top seed and defending champion Levon Aronian of Armenia, Francisco Vallejo Spons of the host nation and Ukraine’s Ruslan Ponomariov. Anand garnered three wins, two draws and the only loss to Aronian in the last round having already won the title in the previous round. On the other hand, World Chess Champion Magnus Carlsen had a a not too good warm-up (by his standards) by standing second behind Fabiano Caruana in St. Louis where Caruana set up a record of sorts by winning seven straight games. Sochi is going to be much more exciting than Chennai was. Magnus Carlsen is a fighter and he knows how to take the last drop of blood out of his opponent. Anand has upped his chess form to an inspirational level. Neither is the underdog now. The gap on the FIDE rating list between the two has narrowed as well. The Sochi World Chess Championship is far more evenly matched than Chennai was. Just a month to go for the World Chess Championship 2014 and chess lovers across the world just can't wait! Photo Chess Trivia: Name the Chess Superstars!